Q: I need your help with nanny etiquette. My nanny whom I adore very much recently stopped having playdates with one of the other nanny's in the neighborhood. Apparently a few other nannies in our neighborhood have stopped as well because she is too harsh with the kids & yells a lot. After hearing some of the comments she has made, I have to agree ("your daughter talks very well, not like these mutes I take care of"...in front of the 2 year olds!). I don't know the parents well at all, but should I say something or stay out of it? A: I definitely think you should say something. I know that as a parent, I would want to know. Think of it this way: if the parents don’t know, you will be telling them something really, really important about the most precious thing in their life. If they know, and condone the behaviour, you haven’t lost a friend because you didn’t really know them and wouldn’t want them as your friends anyway, right? Plus, I think we have to look at the kids as the most important factor. While these days we don't always know our neighbours or their kids very well, it wasn't very long ago that we watched out for each other on everything. The kids deserve someone who will speak up. That’s my 2 cents, but readers I’d like you to weigh in as well. 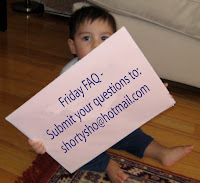 Please post your comment below, including your email address, or email your comments to me: shortysho[at]hotmail.com. Everyone who leaves a comment will be entered in the draw for a free registration for their caregiver to attend the upcoming June 03 PLAY workshop, compliments of the lovely Ms M at Calgary Nanny Connection Inc. If you’re not in Calgary, I’d still love your comments and will have another fabulous freebie in a few weeks! Totally agree! Tell! I would want to know. I think you should let the parents know. It would be one thing if you were worried about talking to the parents about their own parenting skills, but you are not...you are discussing their employee with them. If it were me, I would want to know. As you said, they are trusting their most precious being's with this woman, and the way she interacts with the kids now will help shape the citizens they become. It's not just about no one wanting to make play dates, it has the potential to do a lot of lasting damage. I have to agree also. The nanny is supposed to be another adult in their lives to love and nuture them. We would all be heart broken to learn that our kids were treated that way. So I made the call today. She was totally grateful for my information. Her own spidey sense has been telling her something wasn't right but she had nothing to back her instincts until now. She's trying to work out how to get "proof", maybe a nanny cam, maybe a fake exit from the house. My only concern is for my nanny who will have to deal with the wrath if the "bad" nanny finds out who the source of information was. I am confident the other mom does not intend to discuss our conversation in direct terms with her nanny but there's still that mommy guilt feeling we're cursed with - however irrational it is. Laurie, no guilt, you totally did the right thing. And without judging the other mom, which I'm sure someone less cool would have done! You deserve Cheers! Part 2 - We were mentioned in the conversation. The "other" nanny is so angry she is threatening to phone the government & report my nanny for breaking the program rules. However unfounded her claims are, we could still be investigated. ARghhhhh! Not sure how to deal with this development! Oh for f*cksake. No good deed goes unpunished?! What was the other mom thinking? Way to return a favour. Ok, now that I've vented. I don't think anything will come of this - she's a disgruntled employee, with no credibility. I've asked a few other experts to weigh in on this, stay tuned. Canadian Immigration has bigger fish to fry than your nanny! Still, makes for an uncomfortable situation.